I am one to rave about a place if I like it. I’ll drop your business name on social media to all my friends and family. I’ll even share it with my potential clients. I don’t have anything to lose really. I find it helpful when other businesses share good finds near them as well. I find this especially important when it comes to local small businesses. I love when they form an alliance of sorts and support each other in the industry or just as community participants. However, I often find myself in a hard situation because sometimes shopping with a particular business is not always yellow roses and Blue Bell Ice Cream – disappointments happen. Some people will wonder why I am even bothering to share disappointments with my readers. There are a variety of reasons. For me, it has to do with how I would want to be presented to the world. Yes, I want rave reviews. Rave reviews don’t solve or fix anything. They simply tell me to keep doing what I am doing and all is well. That is not always the case. Often people are afraid to speak up. Let me assure you, if you are disappointed in a business overall or with a product or service provided – SPEAK UP! If you never open your mouth, your complaint will continue to exist no matter how much time passes or how many tries you give them. If the business owners or managers do not know that there is an issue to be addressed, they don’t know they need to fix something. I am not saying to complete trash the company. Please don’t. However, there are ways to let a company know that you are disappointed without completely trashing the company. I also feel that it is important to publicly spread the word about poor service. We live in a very digital society and unfortunately it is often the best way to raise attention with business owners or managers. Why? Because everyone is worried about how they “look” on social media. No one wants to be the owner of the company with a 1 star review and comments that state “I’d give them a negative star if I could.” That is not good. Ever. However, I personally feel that most reviews are made because businesses fail to reach out to their clientele and find out how things are really going. A lot of hot headed business people out there. They are the best at what they do. Or so they think. Reviews will often reveal the truth. Businesses need customers. If they choose not to come back, that does not bode well for success. Remember the business might be for you for whatever reason you started it, but without your customers you are destined to fail. What does that mean? It means that you need to focus on the customer! It is important that we let companies know that their sales tactics are not appreciated. Customers should be treated fairly and without the hard-nosed and condescending up-selling. We’ve already purchased. Offer us another great service, but don’t make us feel uneducated or like we’re making poor choices. It is important to let businesses know that problems were not handled well with customer service complaints. We never want to deal with a lemon or damaged goods, but let’s face it – it happens! We expect to get what we paid for and that does not include products that fail to perform or arrive damaged before we ever get to use them. It is important to let businesses know that we do not feel comfortable or welcome when we walk in the door. In large stores it is not always practical, but Walmart greeters have a job to do and it is not just to check your receipt. “Welcome to…” are some of the best words used at small businesses especially. 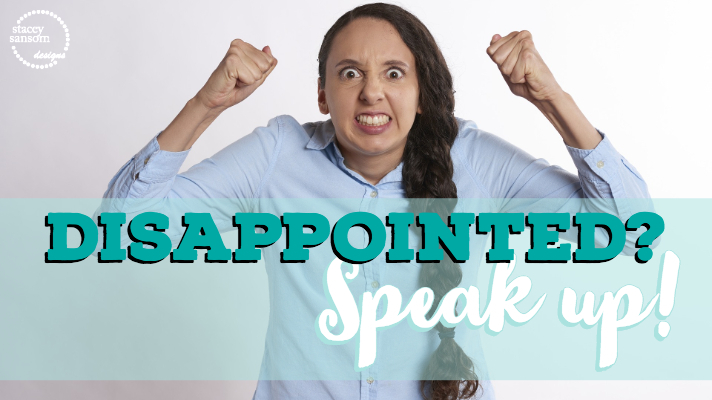 Speak up about your disappointments. Encourage others to speak up and share their disappointments. The counter is that you really need to share the good you experience. When you get amazing customer service – SPEAK UP! Let people know that so and so at such and such is doing a fabulous job and totally rocking the customer service! Why? Give them credit. Let their employers know. Many companies do have employee rewards systems and awards for accomplishing certain things. If you never speak up, business owners and managers never know that so and so is doing their part to make sure their customers return time and time again. I would hope that we share more good than bad, but at the very least, share the good with the bad. What if it is just a personal complaint? If you find yourself in a situation where your complaint is personal, take it up privately with a manager or business owner. They may not think that there are issues. Better yet, you may not be the only one that has the opinion. How do you feel the very first time you walk into a store and are not greeted even though there are employees near the door and saw and/or heard you walk in? Remember this is your first time into the store ever. What if you can’t find something in the store because you’re unfamiliar with the store layout or what products they sell? What if you are simply confused by your options? The frustration continues to rise. You might leave empty handed. You might never come back. It is important that business owners know that their customers are experiencing these feelings because they cannot do anything to rectify the situation if they do not know that it is a concern for their customers. How do you feel when you walk into a store and your are hit in the face with a strong smell? We’ll refer to this as the ever dreaded “perfume counter phenomenon.” You know most people dread walking through the perfume section of department stores. They don’t like the infamous perfume pushers. Some of us even hold our breathes and pray we can walk fast enough to get through the section before we pass out. Go ahead, laugh, our response to certain circumstances may be humorous but still uncomfortable. Do you avoid certain stores for this reason? Do you take the long way around the store to avoid the confrontation and the pungent smells? While it might not be practical for a perfume department to avoid the smells, perfume unrelated businesses should not be a place that people learn to avoid. You want people to walk in the door. There is nothing wrong with the smell of fresh paint. There is nothing wrong with the smell of freshly mopped floors. There is nothing wrong with the smell of fresh out of the box textiles. These are expected in certain businesses. I have found that many business owners don’t know that they are offending their customers with their personal actions and things that they do in their stores. If you as the customer never speak up, they do not know that it is a problem. Businesses should be focused on what the customer wants – what will get them to shop? They should not be focused on the latest fad in environmental air treatments. When I walk out of a store, my purchased product should not smell like the store 2-3 weeks later. I think we can simply open our mouths when we experience something that makes us not want to shop. Is the bathroom dirty? Is the fact that we have to spend 20 minutes looking for someone to help us find proper prices because the shelves are in a disarray. Are we fed up with the 30 minute wait to get fabric cut at certain stores? Do the smells used in stores cause us pain or discomfort? Could employees be friendlier? If you have ever walked out of the store and thought or said, “I wish they…” or “I’m not sure I will ever come back…” Then it is time for you to consider expressing your opinions with the business owner and/or manager. It does not have to be confrontational. It does not have to be hateful. It can show disapproval. It can show disappointment. It is okay to show frustration. I personally will be keeping this in mind as I interact with my local businesses, especially with my local small businesses. Previous post: Bedding: What is the difference? Next post: Made a purchase? Leave a review!